1 (c) Using influence lines find out the shear force at any section for the loaded girder as shown fig. 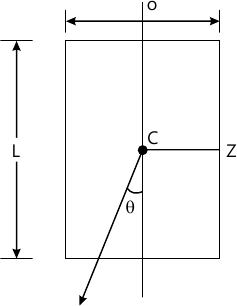 2 (b) Find out the vertical and horizontal deflection of point A of the lamp position shown in fig. Use strain energy concept. 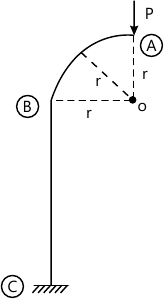 3 (a) A beam ABC is fixed at A and has roller support at end C it is also provide with an internal hinge at B. Determine the slope and deflection at hinge B when loaded with point load W. Use conjugate beam method. 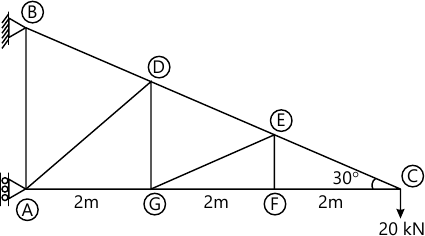 3 (b) Determine the horizontal and vertical deflection at joint C of a cantilever truss as shown in fig. For all members have equal area of 2000 mm2 and E=200 Gpa. 4 (a) Draw influence line diagram for member 4,5 and 6 of truss shown in fig. Assume that the load moves along the bottom chord. 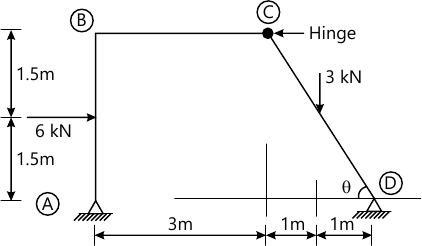 a) Horizontal tension in the cable.